Enveloped, spherical to pleomorphic, 120-200 nm in diameter T=16 icosahedral symmetry. 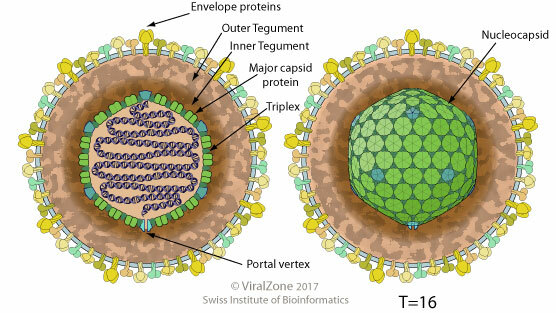 The capsid consists of 162 capsomers and is surrounded by an amorphous tegument. Glycoproteins complexes are embedded in the lipid envelope. Monopartite, linear, dsDNA genome of about 175 kbp. The genome contains terminal and internal reiterated sequences. ASSOCIATED DISEASES Marek-disease causes asymmetric paralysis of one or more limbs, neurological symptoms, and development of multiple lymphomas that manifest as solid tumors. The conserved UL24 family of human alpha, beta and gamma herpesviruses induces a cell cycle arrest at G2/M transition through inactivation of the host cyclinB/cdc2 complex. Marek disease virus encodes an UL24 homolog that should fullfill this role. MEQ antagonizes apoptosis possibly through regulation of its downstream target genes involved in apoptotic and/or anti-apoptotic pathways. GaHV-2 MDV068 is an alternative splicing regulator of host mRNA.